Best Film Director. Best Actor. Best First Film. Best Screenplay. Best European Film of 2013. After a gruelling 18 months on the festival circuit, German director Jan Ole Gerster’s first feature film Oh Boy is about to have a limited theatrical release in the UK, and as can be discerned it arrives with a bucketful of accolades including both critics and audience awards – rarely one and the same! 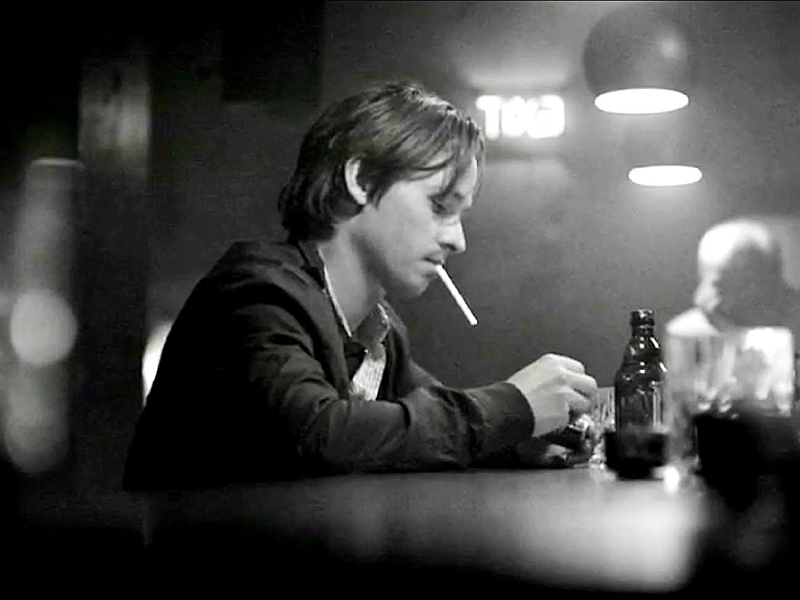 Oh Boy takes a wry look at a young man, Niko Fischer (impressively played by Tom Schilling) as he traverses Berlin – a Berlin of alienated people and locations not usually seen in the tourist brochures. He is an unemployed law student hailing from a wealthy family although, as the audience learn, his father is about to cut off his allowance, having discovered that his son has not actually attended classes in two years. He says he has been ‘thinking’. Now with no means of support, this Candide-like figure drinks and drifts across Berlin in the company of an actor friend. The pair find themselves in a variety of slightly surreal and absurd situations, resulting in a beautifully paced – and performed – cinematic text containing a reflective and moving series of vignettes that add up to an impressive and very confident first film. It took a bold and assured directorial hand by novice filmmaker Gerster (who wrote the excellent screenplay as well) to decide on the visual style – it was remarkably shot in black and white – and to rein in the plot progression in order to allow generous amounts of shooting time for the story to unfold. His choice of lead actor, Tom Schilling, is an inspired one and Schilling turns in a remarkable performance as he makes the character sympathetic and charming while subtly hinting at his existential dilemmas. Even the opening scene is excellently judged as our (anti-)hero starts his day by rising from a bed shared with his girlfriend, from whom he is about to separate. A scene ensues between the two and as the camera focuses on this guilt-ridden and uncertain lone figure sitting at the end of the bed, the title, Oh Boy slyly appears on the screen, over-writing the shot. Then the credits roll as we begin our long day’s journey into the night. James Evans talked to Jan Ole Gerster about the director’s interest in distanced characters, making a road movie inside Berlin, and looking for that timeless feeling. James Evans: How did your screenplay come about – what impelled you to want to make a youth culture film about contemporary Berlin? Jan Ole Gerster: I wasn’t thinking about making a ‘youth culture’ film, or a portrait of our generation or a portrait of our time or young people in Berlin because I think that this is the wrong intention to start out with. I had this character in mind that was somehow inspired by all the characters I always identified with in literature and films. I found it appealing to have a character who does nothing, who is very passive and still, but is wide awake and noticing things, and I thought it would be interesting to send him on a road trip without really leaving Berlin. Your choice of visual style and the interesting and fitting use of black and white – was a gamble and, unlike some recent examples, did not seem to be gratuitous, modish or a ‘knowing’ visual gimmick. How did that decision come about? I was afraid that it was going to be, as you said, received as a youth culture film or some sort of generational portrait that claimed to speak for how 20-somethings feel these days, but I was trying to do the opposite. I was trying to find a timeless atmosphere for the film and so every decision that I made, whether we were looking for locations or the visual style or even the music, was about finding that timeless feeling. I didn’t want electronic music, I didn’t want colour, I didn’t want super-modern architecture. It was important to me because there’s something old-fashioned about this character as well because he doesn’t seem to connect to the world he’s living in. He is distanced and alienated, and black and white provided this sense of distance that I was looking for. Of course, I am depressed that black and white has disappeared from the screen these days, but as you mention there seems to be a bit of a revival of it. The cast is very strong and Tom Schilling in particular is an inspired choice. He turns in a nuanced, balanced and finely honed performance and you give him and the other characters generous amounts of screen time to inhabit these characters. How did you cast him? He was a friend…Well, he is still a really good friend of at least 13 years. We lived in the same neighbourhood and we hung out. We had the same interests and the same sense of humour, and we would go out and see films, and drink together and talk about life and work and the films that he is working on. So when I wrote the first draft of Oh Boy I sent it to him and he called me and said ‘Yeah, I like it, I’m gonna play that part – it would be an honour’. And I was pleased about this, but I said, you know it’s not really an offer, I just wanted to hear what you thought of it (laughs). But then he kept calling me and saying that he would be perfect for the part…And to be honest, the only reason I didn’t think of him was because I envisioned the character to be in his late 20s, and he looks about 20 but in the ensuing year he was smoking a lot, drinking a lot and then he became a father and something happened – he aged a lot in that time! I really think that it just took a lot of time to get used to the idea of working with a friend and of course I don’t regret it, it was the best decision of the whole process. There are some discernable cinematic and literary chromosomes in the DNA of your film. I feel the spirits of Truffaut, Wenders, Salinger, Ashby, Cassavetes inhabit it. But I especially sensed Rafelson, and in particular his masterpiece Five Easy Pieces. This is very interesting, you’re the only one who has mentioned Five Easy Pieces, and it was a film that I had in mind. People ask me if I had Manhattan in mind, but of course I wasn’t thinking about Woody Allen at all. I had Truffaut in mind and I watched Five Easy Pieces with Tom [Schilling] many times and we talked about this film a lot in preparing for our journey. I have just been re-watching all the films that I admire like The 400 Blows and Who’s That Knocking at My Door, which is a super personal film about growing up in a Catholic family among American Italians and in a gangster environment, and it is incredible because the whole Scorcese universe is in that first film. And it’s the same with the Jarmusch and Cassavetes films. So I thought there’s the key to finding your own handwriting – you have to talk about something that you really know and that you want to express – no matter what it is. And you’re right, it was more the spirit of these guys that inspired me than trying to be like them. One question remains: what next? With all the road showing of the film, have you had any time to write? Yes, I had a scholarship last year to spend three month in Los Angeles at a residence called Villa Aurora, which is funded by the German consulate and the Goethe Institute, and I’m going to Rome on a similar thing for two months, so I’m writing something new and enjoying it. After almost 5 years living with Oh Boy, I’m really ready to move on and do something else. It’s fun and it’s tough at the same time because, not being a full-time writer – I have only written one script – I don’t really have a routine, and it takes time to figure things out. I am not a fast writer and not a very patient person so it is torturing me a bit. I guess there are now new pressures because presumably you can more easily attract higher amounts of money this time and there are high expectations for the dreaded second film after such fanfare for the first. Maybe I should just do a high-budget flop next time!